Both have round bellies, are colorful, bring gifts, children love them, their arrival brings joy and their characters have messages to give !! 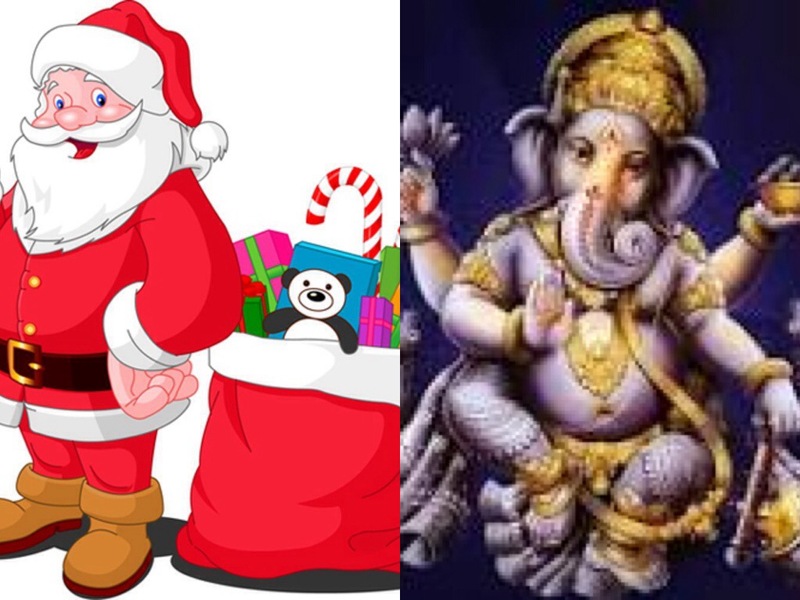 Santa and Vinayaka (Ganesha). Santa is supposedly Saint Nicholas who was called Sinter Klass by the Dutch and the modern day Santa Claus was probably born around 1820, when stores in the US started special Christmas sales. St. Nicholas was a real saint who helped many people and gave away all his wealth. He was especially loved by children and sailors and is supposed to have lived in the 3rd century AD. Santa Claus comes with gifts, it’s a mystery how he fits into narrow chimneys, his favorite passageway and rides a reindeer. Here’s a nice blog by Dan Rockwell on The Santa Claus leadership system. It’s important to start with the question of “what do you want” and work your way through. Let’s look at Vinayaka or Ganesha as he is fondly called … In Hindu mythology, he is Shiva and Parvathi’s son, who is beheaded by his own father because he didn’t know it was his son, while guarding his mother who was bathing. When Parvathi tells Shiva that Ganesha was his son, there is a scramble to find the first animal and bring its head. An elephant was found first and that’s how Ganesha got his famous elephant head. Yeah yeah, there are many modern lessons too in this fable – only the mother knows who the real father is, when powerful men are challenged they get really mad and could behave irrationally, maybe this was the first ever brain transplantation done .. Holds out hope for mankind, and lastly, there’s more in common between animals and human beings than we care to believe. Ok, sorry if I managed to irritate the believers, trust me, I love Ganesha. There is something extremely endearing about his potbelly and the elephant trunk and the myriad poses he strikes. Now drawing a corporate parallel and leadership lessons – the wide ears are for listening, and just as Santa asks what you want, Ganesha listens attentively. Ganesha is the remover of obstacles, and that’s pretty much what a leader is expected to do !! Ganesha’s ride is a mouse – a tiny animal, that happily carries the big man, several messages – don’t ignore the “smaller” players, they can take you for a ride; Empower the small and powerless and they can carry big burdens, what looks ugly and unwanted may actually be very useful, treat everyone with respect and everyone got skills !! Ganesha is the God of wisdom – another hallmark of a great leader, he is wise. Powerful leadership lessons from two supposedly mythological characters… There is more to mythology than meets the eye. If that’s not Leadership 101, I don’t know what else is – and we go around thinking Santa and Vinayaka are just fun and games. Am thinking the people who created these stories (if they are stories) were the first leadership gurus. They knew also that characters that appeal to children, make good leaders… That’s the next thought to explore.